The Newbie is back!! I’d like to talk briefly about ARO (Automatic Reaction Order). ARO is one of the most interesting rules in Infinity. This rule allows you to react when your opponent moves, shoots, etc. Basically, it means that you need to pay close attention when your it’s your opponent’s turn. Djanbazans – These guys have a movement of 4-2 – meaning they’re not going anywhere fast. I use two different flavors of them – the HMG and the sniper. These guys hang out in the back and pick off the enemy in the ARO phase. They also slow down my opponent – you don’t want to rush right in if I’m going to get a shot off with a sniper. MSV2 – this allows me to see right through smoke and allows me to negate the -3 for camo. Sekban – These guys are another slow moving force (4-2) but they have 360 degree line of fire arc! Ever play against a unit that has tactical jump (allows unit to deploy within the enemy deployment zone)? One minute you have everything under control, next minute your opponent is in your backyard ruining your day! Now put a couple of Sekban way back in your deployment zone and you’ll be able to get an ARO off when the enemy unit appears. Druze Shock Team – BS is only 12, but the X Visor alters range modifiers of the BS, Special Skills and Equipment from -3 to 0 and -6 to -3. Equip it with a Spitfire and now you have a unit that you can put into suppressive fire and have a 0 MOD to your BS up to 24”. Not too shabby! Units with Camo – I like these also. Camouflaged markers have a 360 degree LoF and impart a -3 to the opponents attribute (TO camo imparts a -6). Pop these guys out of camo at the right moment and it could ruin your opponent’s carefully constructed plan. What are your favorite ARO units? I’m looking forward to your responses! So some members of the Data-Sphere team decided to try and answer this question, as well. Alkasyn – For me, the best ARO unit is a Total Reaction drone. I believe that the number of dice is the most important factor in Infinity. 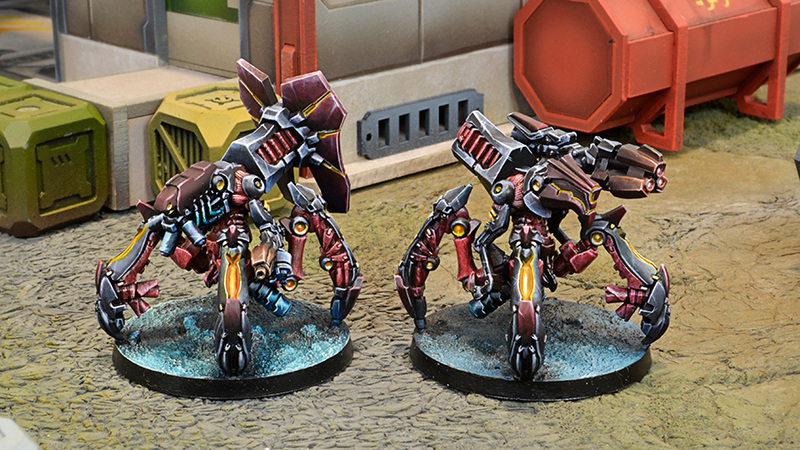 The drones roll 4 dice in 99% of the situations, which gives them around a 20% chance to crit. That, and the fact that in the active turn they can turn to decent active pieces because of Supportware Marksmanship level 2, makes them the best ARO pieces IMO. On the other hand, a Link Team of basic Infantry, like the Ghulam, with long range weapons, like the ML and Sniper Rifle, is also a very potent threat. They only roll 2 dice, though, and although their modifiers are better, they are more expensive overall. The drone wins. Claudius Sol – A good ARO unit? Nothing for me beats the amazing, versatile, ubiquitous, powerful… WarCor? For 3 measly points, you get a WIP 13, S2, ARM 0, 1 wound nightmare with a Flash Pulse. Think: For the price of a servant remote, you get a model that could get you an extra order with a command token, drain at least one order from your opponent to get rid of the nuisance, and potentially even stunt a whole assault! Errhile – What you say is true, however, any model with a Sniper Rifle is viable ARO troop, provided it can outrange the opponent (and have a decent field of fire). While not likely to kill everything that moves, the very cance of it is going to work as area denial (which, in fact, is one of the basic applications of sniper fire RL). Simply put, the opponent will have to either avoid the area, or muster resources (including Orders) to deal with it. Extra skills (Camouflage & Hiding), equipment (Optical Disruption Device) or just plain old Cover will, of course, make them more difficult to hit, and thus more survivable. This, of course, is likely not what the author had in mind when asking about ARO troops, but hey. It works. Also, Sniper Rifles tend to be really inexpensive (less so for MSR / VSRs, especially if we count in an SWC cost). Similar with Missile Launchers, Rocket Launchers, Panzerfausts, Akrylat Kanones and (more situational) Blitzens (and so on). Though the latter 3 have the Disposable trait, so they’re going to run out of ammo fast, especially if Linked (a hint: keep a Baggage REM at hand). ADHL, if the range is right, has a very good effectiveness in ARO, too. Another note – any Terminal Template Weapon is worth it’s weight in gold if you have to ARO a tight-packed group of models. Especially a Link Team: either they all Dodge (thus won’t be shooting you), or you’ll be doing Face To Face with the Team’s Leader, and the others… well, are likely to be just caught in the blast, giving you a good chance of coming on top of this exchange even if you’d lose your AROing model. Though only Missile / Rocket Launchers (and Heavy Grenade Launchers) combine this with a decent range. Also, keep in mind that any unit with appropriate weapon becomes a deadly ARO provider if put into Suppressive Fire. Extra kudos points, if the model in question has X-Visor or 360-degree Visor. While limited to Burst 3 and cut at 24″ range (16″, if you want to keep a +0 range modifier, and lack an X-visor), the extra -3 for your opponent (due to FtF against a model in Suppressive fire state). If the terrain is tight enough, a simple LI squaddie with a Rifle / Combi can cause a real headache… and he’ll be doing it below the effective range of a typical HMG Total Reaction REM. Note: I consider Baggage TR REMs not suitable for ARO role. They’re expensive, but armed only with standard Rifle / Combirifle. Situationally, they might be useful, but as a general ARO workhorse they lack. TR HMG does that work much, much better. Up close, a Direct Template weapon is good, too. Usually used by cheap troops, it allows them the auto-hit capability agaisnt anything in range. No matter how many modifiers this sneaky TO Camo piles against you, the Chainrifle / Flamethrower / Nanopulser will hit it (especially valuable with Flamethrowers). If you have access to them, models with Neurokinetics work great in ARO, too. They usually have better stats than HMG REMs, and lack the typical drawbacks of a REM (can go Prone, for example). However, they can be pretty expensive, especially if armed with a high-Burst weapon (and let’s be honest, I’ve never seen much of a point in Sin-Eater Observant armed with MSR…). Ah, looks like I missed out on the fun. I will give my 5 cents anyway: How about the Zouave HMG? I can deploy the trooper midfield, autocover and camo provides a healthy -6 to hit. The point is to put him in suppression fire for most of the game. It is a good idea to have a briscard with sniper rifle or rocket launcher watching over the suppression fire Zouave so he does not get outranged by an enemy sniper. Admitted, this only works well if I get the initiative and keep the zouave in reserve. Love the answers!! Thank you very much and keep them coming! I like the Smart Missile Launcher Remote! Especially as an ARO piece. It has no negative range band and the template often ruined my opponents day! I have been using a link team of UASRF snipers! 18 points and .5 SWC makes these dudes are bottom of the barrel in price! Being in a link team makes that pesky 4-2 move less of a burden and using them as a defensive link adds some order efficiency. Couple this group with a some orders hogs (I’m looking at you Van Zant) and you have the start to a solid list. I like to deploy them defensively but not stationary because the 3 or 4 trooper commitment would be too taxing therefore I like to use them to take rear objectives or hold deployment side quadrants. I also like to hide the link team leader, watching the team’s backside, but allow the others good lines of fire holding down roof tops, flanks, or avenues of approach. The main benifit to this is that most enemies will be running into 4-6 ARO shots with the range benifit going to the link team. Damage 15 shock is nothing to scoff at either. yep, USAriadna grunts are the classical ARO snipers. Corvus Belli to release new game: Aristeia! Data Sphere - the unofficial Infinity Community. Data Sphere is the international online Infinity WarCors platform for all your updates, promotion of events and other Infinity related news. We work to get all things related to Infinity on this platform, in order to promote the game and expand the playerbase. Disclaimer: Data Sphere does not own any of the products and we are not licensed by Corvus Belli or their partners. Data Sphere loves Infinity: The Game and wants to give it the credit it deserves with this online magazine. Want to write for Data Sphere? If you want to become a guest blogger, write for us or share events on Data Sphere, feel free to contact us! You want Data Sphere to promote your product? If you are a company and want to promote your Infinity-related product through us, feel free to contact us as well! Data Sphere © 2019. All Rights Reserved.